EURODEER members meet in periodic 2 to 5 days meeting that are held every 6-12 months in one of the headquarters or study site of the partner Institutes. These meetings are a key activity of the EURODEER network. The meetings are a valuable opportunity to update all the members on the new developments, to communicate on to each other the scientific outputs/advancements, discuss face-to-face the content of ongoing scientific works and to identify new line of research. 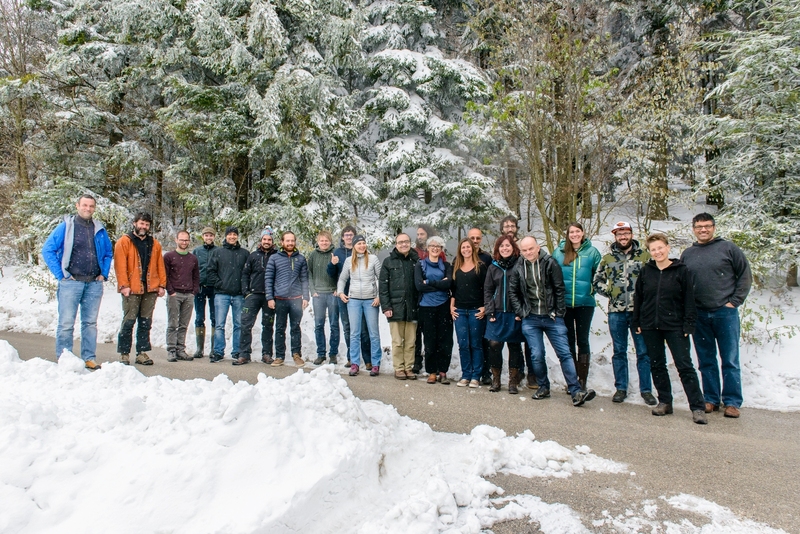 Ultimately, the EURODEER meetings are an opportunity to share knowledge and cultivate mutual trust and a sense of cohesive scientific community that has the common goal to improve wildlife management and conservation with scientific-driven decisions. Meeting are usually attended by 20 to 40 EURODEER members. Next EURODEER meeting will be held in spring or early fall 2018. Summer School: Dealing with Spatio-temporal Data in Movement and Population Ecology, San Michele all’Adige, Italy (18-22/06). 25 students. Organiser: Francesca Cagnacci. External funds from network IRSAE. Workshop: "Sequential Habitat Use by Animals: A Methodological Workflow", Lorentz Center Workshop-'Movement: New Sensors, New Data, New Challenges', Leiden, The Netherlands, 21-25/08/2017. Workshop: "Pan-European Geographic Diversity in Spatiotemporal Sequential Habitat Use for an Ungulate species", NSF Workshop-'Analyzing Movement and Mobility Within Geographic Context’, Ohio State University, Columbus, OH, USA, 10-11/05/2017. Workshop: "A future for a common bio-logging language? Discussions about data standards and interoperability in the bio-logging world", Biologging 6, Konstanz, Germany, 27/09/2017. Conference: "Ungulates in a changing world: consequences for population dynamics, migration and management", Krasny Bor, Belarus, 19-22/9/2016. Summer School: Animal Ecology and Traceability, San Michele all’Adige, Italy (5-8/9). 15 students. Organiser: Francesca Cagnacci, Luana Bontempo. External funds from network IRSAE. Workshop: ESA 2016, Workshop WK 12: "Introduction to Data Management and Analysis in Movement Ecology", Fort Lauderdale, Florida, USA, 7/08/2016. Lecture: "Walking down an uncertain path: studying the movement continuum of large herbivores through the Eurodeer collaborative initiative". Summer course: 'Next Generation Data Management in Movement Ecology', University of Florida, Fort Lauderdale, Davie, FL, USA 9/6/2016. Seminar: "Surfing the wave of wildlife tracking data". Victoria University, Wellington, NZ, 17/03/2016. Seminar: "…and yet they move: Research frameworks and technological perspectives in movement ecology". Harvard Forest, Petersham, MA, USA, 8/12/2015. Seminar: "The movement continuum: insights from studies on partial migration in large herbivores". Dept. of Environmental Conservation, lab seminars, UMass-Amherst, Amherst, MA, USA, 13/11/2015. Seminar: "Walking down an uncertain path: the movement tactics continuum in large herbivores". Yale Research School of Forestry and Environmental Studies, Seminar series, Yale University, New Haven, CT, USA, 25/10/2015. IRSAE Summer School: "Next-Generation data management in movement ecology". FEM, San Michele all'Adige, Italy, 1-10/7/2015. Conference: "The European Wild boar", Velenje, Slovenia, 4/9/2014. Workshop: "Animal Movement in Confined Space: from Space Use Patterns to Epidemic Spread". Bristol, UK, 6-8/12/2013. Summer School: "Next-Generation data management in movement ecology". IZW, Berlin, Germany, 2-8/9/2012. Workshop: "Tracking movement using GPS". Measuring Behaviour MB2012, Utrecht, The Netherlands, 28-31/8/2012. IRSAE Summer School: "Stuck in motion: reconnecting question and tools in movement ecology". Evenstad, Norway, 13-17/8/2012. Public Debate: "From EURODEER to Trentino. The European roe deer: is it really a resilient species?". San Michele all'Adige, Italy, 15/2/2012. Seminar: NINA, Trondheim, Norway, 15/12/2011. IRSAE Summer School "Design and Statistical Modeling of Habitat Use, Selection, Occupancy, and Persistence". Evenstad, Norway, 12-16/8/2011. Meeting: "European Wildlife Research– common future priorities and potential collaboration". Stockholm, Sweden, 16-17/2/2011. Meeting: COST IC0903 MOVE MC/WGs. Mons, Belgium, 20-21/1/2011.